I had never been in a hot air balloon, but if was going to I figured why not do it somewhere spectacular, and I am so glad I chose to do it in Bagan, Myanmar. The spectacular scenery combined with an almost guaranteed to be stunning sunrise combine to make it a truly special experience. 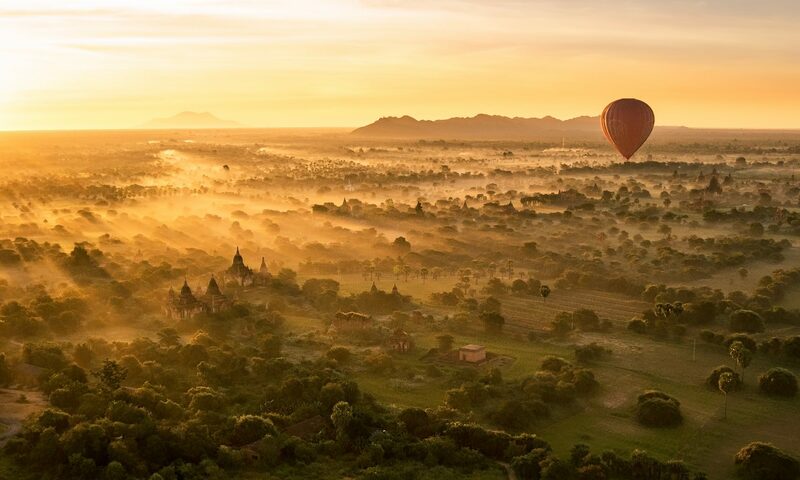 There are three air ballon companies that operate in Bagan with the government imposing a strict maximum number of 21 balloons that can fly each day. Having read numerous reviews I chose Oriental Ballooning. My main reason for this was that they offered smaller baskets – the majority of companies offer flights in baskets which hold 16 passengers however Oriental Balloning have a mix of 8 and 16 person baskets. Baskets with 16 passengers looked quite cramped and if you were in one of the middle sections, you only really had a view out of one side (as opposed to the eight person baskets where pairs of passengers are in corner sections with views in two directions). I contacted them though their website to get a quote, which I duly received via email the next day. As I was happy with all the details in the quote I emailed back to confirm that I would like to go ahead with the booking and also requested that we be allocated a smaller basket if possible – as I was doing this two months before the flight time they were happy to oblige. The next day I received an email with a payment link (to KBZ bank) with instructions on how to complete the payment, this was simple and a couple of days later I received an email saying the booking was completed and asked for some information about when we were arriving in Bagan, what hotel we were staying in and once we had checked in, our room number. I couldn’t figure out why they need our room number but all became clear later. Oriental Balloning called the reception desk at our hotel the night before our flight to pass a message to our room (hence the request for a room number) to let us know the time we would be collected from reception. If you are considering taking a similar flight it is essential you book in advance. There are only three companies (Golden Eagle, Balloons Over Bagan and Oriental Ballooning) allowed to operate in the area and they are limited in the number of balloons they can fly each day. On the day we flew, every single space in every single balloon was taken. I also overheard someone in our hotel trying to arrange a flight for their time in Bagan but they were unable to do so, despite having a few days of flexibility. At 5.30 in the morning we were collected from our hotel reception in a mini bus and driven to a field (after the driver got briefly lost by overshooting the unmarked entrance in the dark – understandable) where all the balloon companies appear to take of from. When stepping out of the mini bus we were greeted by a very british voice welcoming us and asking us to take a seat at one of the empty picnic tables. Once we were seated we were offered tea and coffee along with a selection of breakfast pastries. We sat here for about 20 minutes while the sun began to rise in the background. There is also a toilet available, although it’s an old, local squat style, so I wouldn’t recommend it unless you’re desperate (bearing in mind you’re going to be without one for the next 90 minutes or so). After all the passengers had arrived, been checked off the register and had their refreshments the pilots stood in front of the group and welcomed us all with introductions. We were given some simple instructions to follow and listened out for our pilot to call our names. It was clear that all the pilots loved their job and their enthusiasm really came though. Once all the passengers found their pilots we were taken over to the balloon we would be flying in that morning. We were given a thorough safety brief and then invited to watch (from safe distance) as the balloon was filled with hot air. This was a bizarre experience. A previously flat, empty series of fields suddenly started to feel like a city as the balloons from all three companies started to rise around us. As we climbed in to the basket we were handed a complimentary baseball cap to keep some of the heat off our heads. As we had been allocated an 8 person basket – it was divided into 4 compartments plus an area in the middle for the pilot – myself and my partner had a corner all to ourselves. There’s not a lot of room in the basket, but it was never uncomfortable. Having a corner helped to make sure no one in the basket missed out on a sight. It was then time for take off, which is when the spectacular landscape came into view. I am not sure words can describe how amazing Bagan looks from the air especially in a slow moving air balloon at sunrise, so here are some pictures. The pilot of our balloon was very informative, telling us all about our field of view. The mist that you can see in some photos is in fact smoke, the locals collect dried leaves every morning and evening and burn them. This elevates sunsets and sunrises in Bagan beyond anywhere else I’ve visited, the colours are unreal. The precise path of your flight will vary depending on conditions on the day, your pilot, and the movements of other balloons. There are, though, some things you won’t want to miss on your flight. The first, and relatively close to the take off area, is the Aureum Palace Hotel and it’s controversial viewing tower. The viewing tower is seen as an eye sore by many but does provide for some spectacular views, especially at sunrise and sunset. The hotel itself has been visited by a number of celebrities in recent years, including Beyonce and Jay-Z. We stayed in a villa at this hotel, and there’s a review coming soon. You should also be on the look out for Old Bagan town. The large white building in the image below is, I believe, the Archaeological Office of Bagan, should you ever doubt where your entrance fee is being spent. Old Bagan also has a concentration of temples and pagodas around it with them, generally, becoming more sparse the further from the town you travel. But as there are over 2200 of them, sparse is a relative term. There are also thousands of temples and pagodas scattered throughout the Bagan area many of which look stunning from the air in the warm morning light, surrounded by smoke. Towards the end of the flight we passed over a couple of small villages which afforded a unique view of some of Bagan’s local residents, who seemed keen to wave and take pictures of the low flying balloons. Coming from Bristol in the UK we were interested to see that the the balloon itself was made by the Cameron balloon factory in our home town. After about an 1 hour in our hot air balloon we descended into a field where we were treated with a glass of champagne, some fresh fruit and a certificate. The locals took this ad an opportunity to try to sell us some of their wears whilst we were a captive audience (we didn’t know this would happen, so didn’t bring any money as everything was pre-paid). Afterwards a mini van took us back to our hotel where we had a spot of breakfast and rounded off the morning with a quick nap before heading out to explore the delights of Bagan once more. The flight cost about £300 each, which seems expensive but is understandable given the location, maintenance costs of the balloons, licensing costs to the government and having to hire specialist pilots. There was also a small army of support staff following the balloons along their flight path to ensure everything goes smoothly. In doing my research I had read that you could occasionally get a better price by using a local travel agent to book your flight but deemed this a risk not worth taking. As I said above we booked our flight a few months before we did see a couple arriving at the hotel hoping to book a flight to only be told that all the flights were fully booked for the duration of their stay so if this is something you are considering I would strongly recommend you book this in advance. This was one of the highlights of our time in Myanmar and something I will never forget. If you have the budget I highly recommend taking in this experience. Before travelling to Myanmar I had read that getting cash may be an issue, that the country was moving away from the US dollar and trying to increase the use of Kyats (pronounced similar to “chat”). As we were travelling around South East Asia we took bunch of crisp US Dollars (USD) to both spend and exchange when we arrived in countries with closed currencies. On arrival at Yangon airport (international terminal) there is a row of currency exchangers right outside arrivals with various different rates on show in the windows relating to different currencies. I chose the one with the best and duly asked for the amount I wanted. Now this is the important bit if you have new (the ones with the blue strip down the middle), pristine, dollar bills of higher values (i.e. $100) you will get a better exchange rate. The exchange rate I got at the airport using my shiny new $100 bills was the best I saw in my entire time in the country. I also took bunch of smaller bills which I didn’t exchange to use as well. So how much kyat do you need? Well we stayed in fairly good hotels which were all pre booked through Agoda. You can guarantee a booking without having to pay until a couple of days before your check in date and the cancellation policies are also pretty good if your plans change, which ours did. As these were all paid for through Agoda I didn’t have to worry about carrying the cash to pay for my accommodation. There were a couple of hotels I had booked direct and all of them took either VISA or Mastercard credit cards with a small fee (about 2-3%), as I said these were all fairly good hotels so I am not sure what others would be like. The only thing I therefore needed cash for was local transport, food, souvenirs etc. When I ate at the hotels or booked something though them they always wanted USD and weighted the exchange rate to Kyat to encourage the use of USD (anywhere from 10 to 30%), however when we were out and about at local restaurants, or in markets, the use of either Kyat or USD was accepted although I always got the impression the USD was preferred even by the locals. Notwithstanding the above, most foreigners have to pay to enter temples or the reservations at Inle and Bagan and for these, Kyat was the currency of choice. Transport was cheap, with a taxi ride across Yangon costing around £2. Food varied depending on the sort of restaurants you frequent. You could easily pay £30+ for a meal for two in a decent hotel. Meals in local restaurants were a fraction of that and two people can easily eat and drink for less than £10. The usual warning apply to eating in, and booking things through, hotels. A car from the airport to the hotel cost roughly four times more than a local taxi in Yangon, but you might want to take this option when first arriving for the sake of convenience. I didn’t actually use all the cash I had with me but there were ATMs in almost every hotel I stayed in and there were a few dotted around in the bigger towns. In terms of my credit card working in Myanmar, I tested all of mine which included MasterCard (with Lloyds Bank), VISA (with Barclay card), my other half also used his HSBC VISA with no issues. American Express was not accepted. If you do end up with some leftover Kyat when leaving Myanmar you can change it back to USD (at the slightly worse rate) at Yangon airport however you must do this before you go through security. When you are air side there are no currency exchange booths the only way to get rid of it is to spend it in the remarkably well stocked duty free with an exchange rate weighted to discourage you. I found myself in this exact position but luckily needed to replace my sunglasses so was only left with a few souvenir notes and enough for a bizarre Burger King.